How many times have you felt nostalgic for a coloring book but have been too embarrassed or prideful to go buy one? There is something therapeutic about methodically coloring in the lines of a drawing. Coloring 4 Kids is an app that enables you to relive the joys of childhood without the humiliation of someone finding coloring books and crayons lying around your house. The app is designed as a coloring book and it costs $0.99. It is supposed to be for kids as the title suggests, and which I didn’t realize until reading the credits, but I can’t stop playing with it. This is a perfect app for times when you need a major distraction for your children or for yourself. You have the option of choosing from 5 themes, outer space, cars, garden, sea life, and education. In each of the themes there are 4 or 5 pictures to choose from. Once you have chosen your picture, a task bar appears at the bottom of the screen and the picture is set up on a clipboard. On the task bar are crayons, stickers, an eraser, a squeegee, and a frame for you to use for your picture. The eraser is for small areas and the squeegee is to erase the whole picture. The stickers option is a definite reminder that this app is designed for children with choices like, a rainbow, car, heart, star, bubbles, and a balloon. Another tool provided is a magnifying glass to color in the smaller areas of the drawing. After you are done coloring and framing you are given a grade on the picture. Basically, the more colors and stickers you use, the better your grade, regardless of what the picture looks like aesthetically. You also have the option to save the image to your iPhone, iPad or iPod Touch photos if you feel like it is worthy. The only frustration I have with Coloring 4 Kids is that there aren’t more colors and sketches to choose from. After awhile of coloring the same drawings—there are 22 drawings total—without a broad range of colors to choose from, the app gets tiresome. 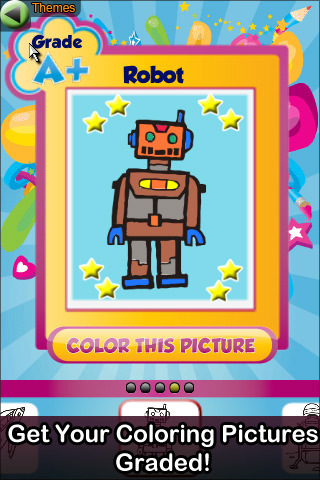 AppSafari review of Coloring 4 Kids was written by Vanessa Paszterko on July 5th, 2010 and categorized under App Store, Art, Education, Fun. Page viewed 5112 times, 3 so far today. Need help on using these apps? Please read the Help Page. Nice apps. My daughter likes coloring books, especially LH Kids Coloring Book. It’s free in iTunes.